They have no insert and should be released in 6-8 Months. The pics on GolfWRX are of a 33/350. Base Head weight is 310 and has 2 20 gram weights in the sole to bring the weight up to the 350. Check it out. There's also one on eBay as we speak. It's already at $2225 USD although it is a Tour model. There's a guy at GolfWRX.com that already has a Studio Select some great pictures here. It's a sample as well. 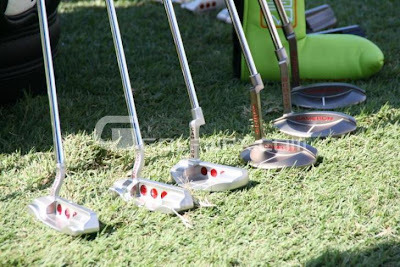 There are some starting to pop up as well at tour events like the Sony Open last Week.